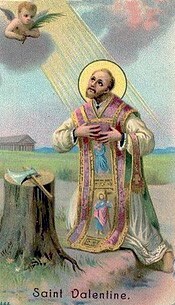 Today’s Saint of the Day is from our favourite Jesuit blogger Brother Dan! Ah, Valentine’s day. Actually, I will say that as a Jesuit brother, this is one thing I don’t miss that much! Still, there’s much to be said about the wonderful energy that emanates from this day, where lovers young and old make special plans to celebrate their love for each other. I hope the fact that this year, Valentine’s day was preceded by Friday the 13th won’t put too much of a damper on your own ambitious plans this weekend! And so, to join you in celebrating this special, special day, I figured I’ d do a special entry on the most obvious saint for this day! Saints Cyril and Methodius of course! I’m letting these two Evangelizers steel your thunder today! How do they trump Saint Valentine you ask? Well, I suppose they don’t, and I’m just messing with y’all (and if you’re really upset that I did that…It was Holly’s idea!!). However, as cool as I’m sure St Valentine was…these two bros actually brought Christianity to all of Eastern Europe –including Russia-. ( and yes, that is why the Russian Alphabet is called Cyrillic. All the Cyrillic alphabet really did was adapt the Greek alphabet into a script for the Slavonic language. Why is it not called Methodic…I have no clue. Ask Richard Bernier. He knows everything!). In fact their role in the history of Christianity was so immense that in the 20th century, “Saint Pope John Paul II named the two brothers the patron saints of Europe along with fifth century monastic leader St. Benedict.” (source: Catholic News Agency). Part of the secret to the brother’s success was that they were unafraid to learn new languages!! Case in point: During the 9th century The Germans had sent missionaries to Morovia (Czech republic) to convert people, but there was little success achieved. It’s only when the two brothers and their ability for new languages came to region that the Good news could finally be conveyed to another part of Europe! So let’s give thanks for our Saintly brothers, and for the Orthodox church with this prayer: Heavenly Father, You brought the light of the gospel to the Slavic nations through your sons, Cyril and Methodius. Open our hearts to understand your teaching, and help us become one in faith and in praise through Jesus Christ. Amen.